Have fun, make friends and just PLAY! Play Events for the whole family, all ages and levels are happening near you in Florida in March, with more than 60 registered. Play Days and Play Events welcome players of various ages and ability. Participants attempt to serve, rally and score, and results are not documented. A Play Day allows kids to get comfortable in a low pressure setting. With an emphasis on fun, kids will gain confidence and play experience and will want to continue playing on your courts. 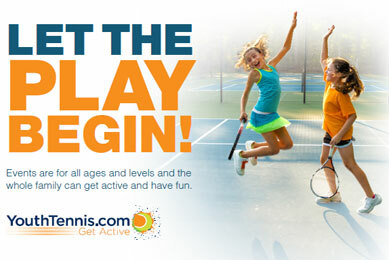 It's easy to find places to play and YouthTennis.com connects you to all the fun. Get playing today! Click here or check the listing below. World Tennis Day on March 3 is the international effort to get kids excited and active in tennis. It is a celebration of tennis around the world that includes professional tennis matches in New York City, Hong Kong and London. The televised World Tennis Day celebration at New York's Madison Square Garden will feature Novak Djokovic squaring off against Andy Murray, and Bob and Mike Bryan taking on John and Patrick McEnroe. USTA Tennis Play Events in March showcase how fun and easy it now is for families to get into the sport. These events will also allow parents to sign up their children for spring and summer tennis programs. For more info go to www.youthtennis.com/find_an_event.